Weighty Matters: Weight is Food. Health is Fitness. A fascinating albeit small study out of PLoS ONE adds to my personal confirmation bias that the driving force behind societal weight gain isn't a decrease in burnt calories, but rather an increase in consumed ones. Now to date we've seen doubly labeled water studies (our current gold standard in measuring total daily caloric expenditures) which have demonstrated that we're not burning any fewer calories now than we did in the early 1980s, and that we city folks living in North American luxury burn just as many daily calories as folks living in developing nations. Here the authors took things one step further back into human history and using doubly labeled water they measured the energy expenditure of 30 Hadza foragers - a hunter gatherer society that live in a savannah-woodland area in Tanzania (that's a few Hadza up above). 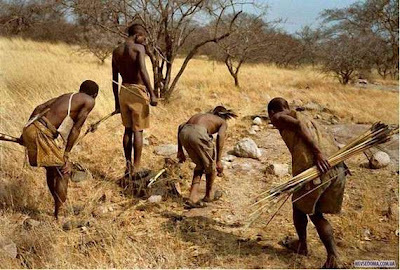 "the Hadza hunt and gather on foot with bows, small axes, and digging sticks, without the aid of modern tools or equipment"
The authors hypothesized that if a lack of physical activity were responsible for the rapid rise in global obesity, that the Hadza's lifestyles ought to burn a great many more calories than ours. Not surprisingly the Hadza were found to be highly physically active and quite lean (their average BMI was reported as roughly 20). But what about their daily burns? The authors found that energy expenditure among both Hadza men and women did not differ from those of men and women living in our modern day utopia. The authors report too that their multivariate analyses confirm that the lack of difference is independent of weight (meaning that the increased calories associated with simply carrying heavier weights here in North America don't account for the equivalency of findings) and body composition differences (lean and fat mass). Interestingly too the authors did not find any correlation between total daily Hadza walking and their total energy expenditures meaning that regardless of how many kilometres they walked daily, they burned roughly the same number of calories. "that TEE may be a relatively stable, constrained physiological trait for the human species, more a product of our common genetic inheritance than our diverse lifestyles"
We haven't slowed down at all over the course of these past 50 years and perhaps not since the Pleistocene era which lasted from roughly 2.5 million to 11,700 years ago. If we haven't slowed down in 11,700 years and yet our weights have risen dramatically the only other possibility, and it's the one I subscribe to, is that we're eating a lot more than we used to. But please don't read this piece and think that exercise isn't important. Instead read it and recognize that while your weight may be primarily determined by what you eat, there's likely nothing more beneficial to your health than regular exercise. The gym may not make you slim, but study after study after study reports that it will keep you living longer, and living better - and those outcomes are far more important to your quality and quantity of life than what your stupid scale might tell you in the morning.